My friend Anne always has cool food items for me. My last visit to D.C. I found a jar of Speculoos sitting in my in box in my bedroom. Anne had it delivered from Paris and told me she found out about it from David Lebovitz. Anne is all iPhone wired and has David's app at the ready to receive any new musings from his kitchen in Paris. Without much effort, she pulled up his blog right there on that little phone and I read his posting on my new treat. I had been harboring it, trying valiantly not to waste it by simply eating it out of the jar. If you haven't experienced them, Speculoos are little Belgian cookies, all crunchy and gingery. 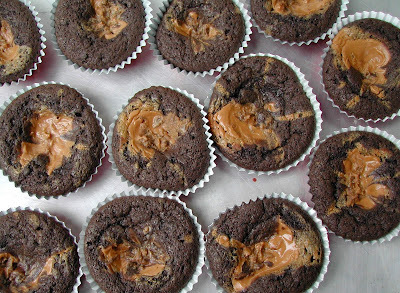 The spread has all the flavor of the cookies in a silky paste the consistency of peanut butter. Think about taking your favorite cookie, grinding it up, binding it with silky butter and spooning it on... well a spoon! Wednesday, the New York Times featured a blurb about Speculoos, so I figured it was time to get out there an make something with it. The natural idea for me was to use it like Nutella. 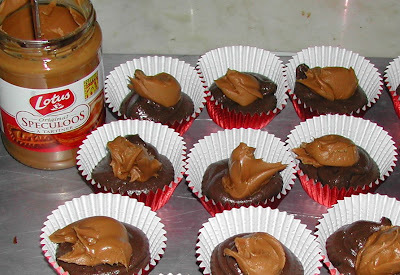 For several years, a self-frosting Nutella recipe made the rounds on the Internet. We made Halloween cupcakes using a similar recipe. I dredged it up and tweaked it a bit to make these Speculoos cakes. Give them a try. Cream the butter and sugar until fluffy, 2-3 minutes. Add the salt and baking powder to the flour and whisk together to incorporate, then add flour mixture to batter. They are best served warm from the oven. If you know Anne, tell her to bring you a jar from Paris. If you don't, you are on your own. Check out the blurb in the Times for shopping options.